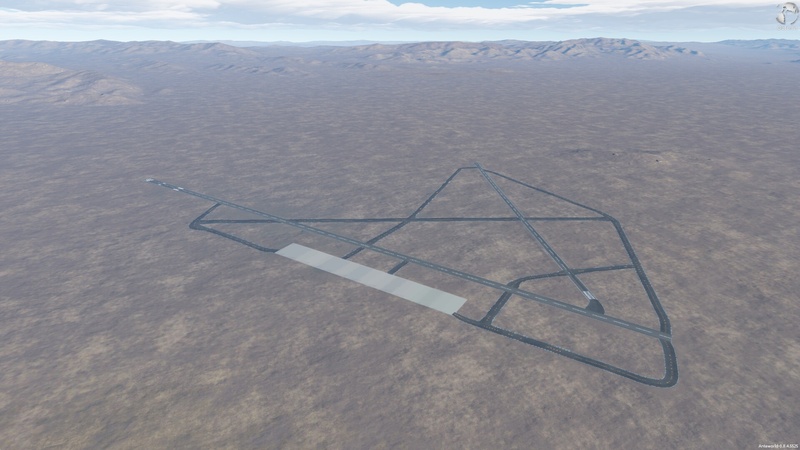 As requested by Hooves, here is the Creech Air Force Base, a military airport located at the north of Las Vegas. Not sure if I will have the time to improve it, but it will be a nice starting point for those who wants to explore the Mojave desert or test their landings skills. Runways are mostly accurately placed. KW71's Lake mesh is included in the package, since I also aded a good chunck of the Lake Mead, south of the airport. A campos is included (Creeks AFB) if you want to acess quickly the airport. Hey man this is really awesome. I cant wait to start adding to this. If anyone wants to colaborate with me please send a PM. Again ty Acetone! Looks really nice!!! The fact that the tracks are alone, like in the middle of nowhere, is kind of hypnotizing... Come and land heeeereee. Does anyone have models of the clam shell hangers? It's the largest one available. Those will work. I'm also looking for the kind you find on the arma 3 small island airfield. I forget it's name.